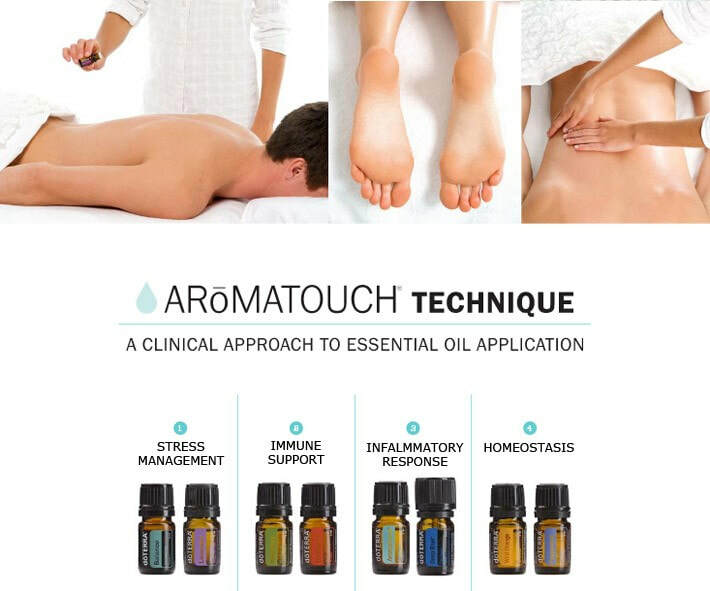 The Aromatouch technique is a very gentle feather like massage using 100% pure high quality essential oils. ​This wonderful nurturing experience works on many levels. Emotionally it allows for the recipient to relax and experience human touch. The light feather like massage movements take the recipient on a peaceful journey where the oils are slowly introduced one by one. 4 pure single essential oils and 4 pure blended oils are applied in a specific order. The combination of the aromatic properties can improve our mood and a sense of well-being. Each essential oil aims to bring the body into a state of balance, homeostasis, therefore working on a physical level too. ​Who can it benefit? The Aromatouch Technique benefits everyone! Especially those who are stressed at work, school or home. Those who lack human contact. A child who needs individual care. People involved in sporting activities and need some time out. It can be adapted to accommodate young or sensitive skin so that anyone can benefit without the worry of overwhelming the body. My 10 year old 'highly wired' child loves to receive this massage. It always leaves him with a sense of calmness. The treatment focuses on the back and feet. I can incorporate hands too at the clients request.